At long last, my kitchen is back in use! 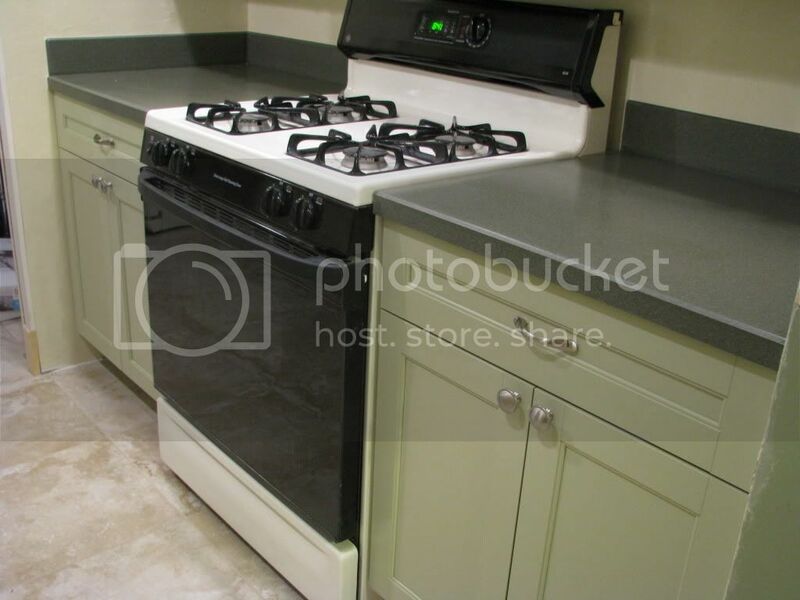 I have gas for the stove, water for the dishwasher, a sink and faucet with running water...and counter tops! There is still some trim to put up and paint and I need to find back splash and install it. I am in quite a quandary as to what color to select. I like the glass mosaic tiles, the small squares. At first I was thinking green/clear/yellow would be good, but now that I see the new kitchen, I am wondering if what I really need is a contrasting color that will pop when it goes up! What would you suggest? I could really use some help here! A dark orange or yellow? That would be a contrast and dark yellow would be nice with light yellow w walls. 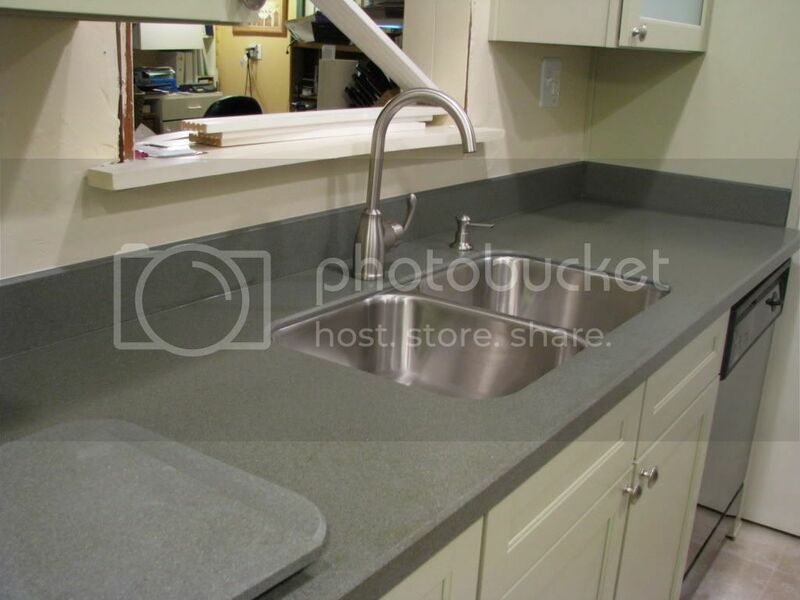 Love the look and glad you did not get a white sink like we did that always looks dirty now. Lisa, thanks for the suggestion...I plan to consider each one! I'm glad the sink isn't white, too. The otjer one was off-white and looked horrible all the time! Diana - Good thought. I will look for the tile you suggest and see what I find. Online is on my schedule, too. Thanks for your help! Awesome!! I think I would use a color similar to the counter-tops xo P.S> Happy St Pattys Day! Katherine, Happy St Pat's Day to you, too! I hope it's a green day! LOL! Thank you for the suggestion for my kitchen! This will be a fun project! Woooooo, whoooooooooooooooo! It is so beautiful! I love all the colors. It looks *awesome* Grace. So so happy for you. Enjoy! Happy St. Patricks Day! Thanks, Ginger! I am so pleased with how it all turned out. It's scary picking everything out and hoping it will look like you THINK it will. Your kitchen is looking great! I like the colours and would probably add a light green. Let us know what colour you choose. By the way, I am also a new Follower on Linky Followers! :) Take care and have a good weekend. Judy, so good to see you! Thank you for your ideas and for following on LInky's. Maureen, thanks for that thought! Hmmmm....more to consider. I wish we were in a larger city so I had more choices of stores. I wonder if online stuff will look as good in person! Maggee thinks: You definitely need to ‘pop’ the room with an accent color. Tiles with a contrasting color in a subtle expression, like on each tile in the accent color in the form of flora or another SW motif, with an off white backround color. The opposite on the color wheel of the ‘moss’ green we see seems to be from apricot to a salmon shade, peach might be in the middle, the photo relay is not clear. Online photos are subject to their color modules relaying colors, and will vary and not be true. You need to go to a real store with your green sample and if you have natural light coming in the kitchen now, take the color samples outdoors before you choose one. Then, like Maureen suggested, continue your accents with wall and counter objects with warm yellows and peaches. Your eyes will delight to the everyday vision you get each day walking into your new home environment! Love you! Wow! Now, that's a detailed suggestion! I love peach and warm yellows, and I agree I need to see the tile in person before I make a decision. I'll take all of these ideas and go shopping! I think this will be a great adventure! Thanks, Mag! My advice is what you pay for it, nothing. That said, I love the idea of the glass tiles. Maybe the long slender mosaics. I would choose something to blend with the countertops. Perhaps with a mirade of the subtle greens. I agree with someone who suggested the tile will remain for a while. Pops of color in canisters, pitchers, planters and tools could be changed out at will. You have done a fabulous job so far, I am sure whatever you choose will look beautiful.